One year later, memories of the aftermath of Hurricane Harvey are grey and hazy, much like the lingering autumn skies that dropped trillions of gallons of water across Greater Houston. Before the flood waters receded, Collaborative for Children, the Child Care Resource and Referral (CCR&R) agency for the 13-county Greater Houston region, faced a critical challenge; With so many child care providers reaching out to report damage and rising concern that the storm had destabilized the entire child care network, who should step forward to seek solutions? With so much at stake, the Collaborative for Children made the decision to step forward. 428 damaged child care providers, serving approximately 25,000 young children, have received $2,981,106 in financial assistance via equipment and materials vouchers and recovery reimbursements. However, the Harvey recovery process is still early and incomplete. For child care providers participating in the recovery, we’ve just begun building the bridge toward greater resilience and higher quality. As we’re reminded now with areas across the country prepare for approaching hurricanes, what we know for sure is that the next storm is coming and child care providers and young children will be disproportionately affected. Reconstruction, repair, and replacement costs can overwhelm the financial capacities of child care providers that often operate on slim margins and limited financial reserves. A fragile early education and care network is more susceptible to chronic stresses and future shocks, with downstream consequences devastating child care affordability and accessibility for vulnerable communities. For the good of the families and young children that rely on stable early education and care in every community, CCR&Rs should be available after disasters to prioritize the unique needs of child care providers. CCR&Rs operate at the intersection of local, regional, state, and national networks, with partnerships extending from local early learning classrooms to federal funding mechanisms. The pressing concern in the days, weeks, and months following disasters in determining damage. The Houston metro area is larger than the state of New Jersey, and there are more than 4,200 child care providers in the 13 counties of Greater Houston. Identifying how many providers have been damaged and how much damage they have sustained is challenging, but necessary, to design an effective response and recovery program. As much as possible, Collaborative for Children filled the information gap that emerged in the aftermath of Harvey by focusing on actionable data collected in the most direct, and least burdensome, methods possible. We tested and standardized survey instruments to focus on exactly what we needed to guide our decision-making and combined phone, electronic, and on-site outreach efforts. Different disasters demand different questions and pose different burdens on communications, but thinking through basic survey templates and collection methodologies is a good start. On Nov. 7 from 2-3 p.m. ET, join us for a special webinar, Coming Back Stronger: Collaborative for Children’s Response, Recovery, and Resilience Plan after Hurricane Harvey. When Hurricane Harvey struck land, Collaborative for Children’s core staff were already fully dedicated to ongoing child care provider quality improvement, family engagement, and policy and advocacy initiatives. Therefore, once initial feedback from child care providers indicated widespread damage across Greater Houston, Collaborative for Children’s senior leadership team recognized the urgency of establishing a stand-alone team to manage the Harvey response and recovery program. We developed and staffed a response and recovery platform that integrated new, full-time personnel with existing staff and capacities across core organizational units. By October, five full-time response and recovery coordinators joined a disaster response and management structure that included participation from specialists in child care quality improvement, CCR&Rs, family engagement, communications, fundraising, advocacy and policy, evaluation and learning, and finance. Once the team was set up as part of a comprehensive, integrated response and recovery platform, identifying funding to maintain program continuity became a top priority. We then put together initial planning grants with major partnerships to fund the response and recovery program. The size of the response and recovery team should reflect the anticipated size of the programmatic response. Harvey was unprecedented as were our efforts to develop an appropriate response and recovery team. As child care providers struggled to recover after Harvey, Collaborative for Children was dealing with competing demands. Providers needed immediate support, but each provider’s needs were unique. The response and recovery program needed to provide efficient, timely support, while also ensuring each provider has their individual needs addressed. Collaborative for Children created and piloted key response and recovery data collection, analysis, and decision-making plans, tools, and templates, including the multi-year, three-phased response, recovery, and resilience framework, two rapid electronic damage assessments, a comprehensive on-site damage assessment, a data-driven voucher processing rubric, and the individual recovery plan template. This testing and learning process has resulted in a seven-step process that allows Collaborative for Children to rapidly assess damage via online form or phone interview and then distribute immediate assistance in the form of an initial equipment and materials voucher to kick-start the response and recovery process. After the initial voucher, a response and recovery coordinator conducts a site visit, completes a comprehensive site visit survey and develops an Individual Recovery Plan for each damaged child care provider. Based on their individual needs and recovery plans, child care providers can then access follow-on equipment and materials vouchers and/or reimbursable recovery assistance. The total estimated time commitment for a damaged child care provider to work through the standard response and recovery process, which includes multiple damage assessments (virtual and onsite), a professional development training, a customized recovery plan, three opportunities for financial assistance through vouchers and reimbursements, and a linkage to long-term quality improvement through Texas Rising Star, is approximately eight hours. This response and recovery approach balance rapid relief and customized support by prioritizing a streamlined process and leveraging Collaborative for Children’s existing capacities, such as the Institute for Early Learning, and partnerships, including online voucher portals with established early learning vendors. In this way, Collaborative for Children has developed a response and recovery process that provides immediate relief and follow-on customized support for each damaged child care provider. Greater Houston is one of the most demographically diverse regions in the United States. During the immediate disaster response period, there were barriers, such as language or internet access, that prevented some damaged and eligible populations from accessing response and recovery assistance. An effective regional response and recovery process must try to ensure that no damaged child care providers are left out. Collaborative for Children has developed online resource links for child care providers, families, and stakeholders who want more information about the response and recovery process. This information includes a Response, Recovery, and Resilience Plan Dashboard that is updated weekly, a Damage Assessment and Response and Recovery Map, guidance for providers to access recovery assistance, and resources for families. We have created a vulnerable populations coordinator position to focus specifically on reducing the barriers for vulnerable populations to access response and recovery assistance. Recent initiatives have included procuring translation services so that communications are tailored to common local languages, such as Spanish and Vietnamese, mapping zip codes by socio-economic status and heavy flooding damage to create a master target list of potentially vulnerable child care providers, and standardizing outreach to vulnerable providers via emails, calls, and site visits. The damage caused by Hurricane Harvey threatened to exacerbate an already significant gap in the number of quality early childhood spaces available for young children and stall or erode progress that had been made in improving the quality of early childhood education and care. While addressing the damage caused by Harvey was the urgent task, failing to connect response and recovery work with long-term quality improvement and resilience initiatives would ensure child care providers remain vulnerable to future disasters. Therefore, we recognized that only responding to the damage caused by Harvey was insufficient. Collaborative for Children opened free access to the Creating High-Quality Early Learning Spaces course on the Institute for Early Learning online platform. Completing this four hour course, thereby ensuring damaged child care providers use response and recovery resources to create high-quality early learning environments, is a condition for accessing the initial equipment and material vouchers. For those damaged providers who prefer to attend in-person training, we have organized monthly in-person training opportunities. Additionally, as part of each child care provider’s individual recovery plan, Collaborative for Children recommends pathways for accessing ongoing training and promoting certification in Texas Rising Star, the state’s voluntary quality rating and improvement system. Texas Rising Star certification increases child care providers’ access to resources and support that increase quality improvement gains, thereby linking response and recovery assistance with long-term quality improvement. 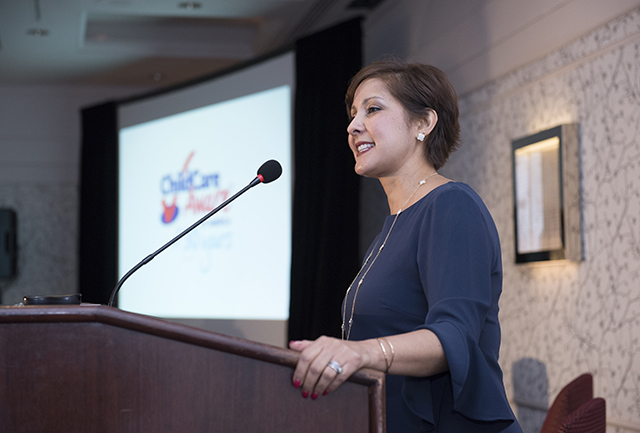 With more child care providers certified in a larger Texas Rising Star network, the early childhood education and care system across Greater Houston will be higher-quality and more resilient in the future. So, what is the role of CCR&Rs after disasters and how can we serve as catalysts for a responsive, inclusive recovery that results in a more resilient, higher quality early education and care network? On Nov. 7 from 2-3 p.m. ET, join us for a special webinar, Coming Back Stronger: Collaborative for Children’s Response, Recovery, and Resilience Plan after Hurricane Harvey. During this webinar, CCR&Rs will learn more about this approach used at Collaborative for Children and why they chose the process that they did.